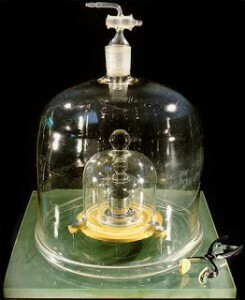 The primary International Prototype Kilogram rests under triple bell jars in Sevres, France. Six other copies are preserved in a vault with temperature and humidity controls maintained by the Bureau of International Weights and Measures. The standard kilogram was constructed in 1879 from an alloy of platinum and iridium. It is a smooth tiny cylinder, extremely dense and heavy. All over the world, all masses and weighed quantities are compared to this international standard weight. (2.2046 pounds are equivalent to the kilogram.) There are forty other Protocol Kilograms kept in different countries as their own standards. Thousands of metrology departments regularly compare their local kilograms to their protocol standards. Periodically the protocol kilograms are compared to each other. The problem is that over the years the different standards, stored at slightly different gravitational environments, are drifting apart. Which one is right? Are some getting heavier or is the main one getting lighter? Standard kilograms are much like the standard cesium clocks. They define mass and time. They do not actually measure it. The drifting standards are a serious problem for scientists who define all reality with a system of empirical measuring. It is such a serious problem that some want to change the standard kilogram to a watt-balance that is calibrated using gravimeters. The watt-balance measures the electrical power necessary to counteract the earth’s gravity. Yet gravity is the least understood and the most imprecise measurement. The problem with empiricism is that it is ultimately an exercise in metaphysics. First you must assume that atoms do not change the space they take up, their inertia and their clock rates. Then you can use this assumption to calibrate the primary measuring unit used in mathematical science – the cesium second. With the second you can calibrate the meter. With the meter and the second, you can circularly calculate Earth’s gravity. With all of these, you can construct a precision watt-balance to eliminate the problem that standard weights are a-changing all over the world. How could the standards affect me? The problem is that the structure of scientific reasoning, especially its stories about beginnings, are based on precision measuring. For example, scientists precisely measure the wavelength of light from billions of galaxies and compare them to their standards here on earth. Not a single ancient galaxy clocks the frequencies of modern atoms. Some early galaxies clock ~7% of the frequencies of modern atoms and the clocks in closer galaxies steadily increase their speed so that the fastest atomic clocks are local . Our mathematical laws of gravity work, says the scientist. Yet scientists surround every galaxy with a cloud of invisible matter to force their laws on billions of non cooperating star aggregations. But, thinks the scientist, we compare our standard clocks with each other, and they track together. Wait! NASA sent out radio signals generated by hydrogen maser atomic clocks to four distant spin stabilized spacecraft: Galileo, Ulysses and Pioneers 10 & 11. (Spin stabilized spacecraft are not accelerated from electrical inertial wheels since they spin like a gyro or a top). The spacecraft returned the signals (in the case of the Pioneers, hours later) by means of transponders. The transponder locks onto the received signal, multiplies it by a factor and returns the same clock signal back to earth using the same antenna. The farther the spacecraft got, the more the signals did not match the previous clock frequencies. The acceleration of local clocks tracked with the acceleration of ancient atomic clocks (relative to distance) at the Hubble ratio times the speed of light. Evidently all atomic clocks are accelerating with the closer ones running fastest. 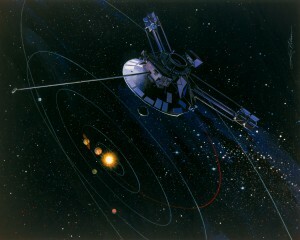 The drawing of a Pioneer spacecraft is from NASA and is in the public domain. A scientist might claim. Our atomic clocks and our watt-scales are the most precision instruments possible. We measure everything with great precision and science is about measuring – not just observing. It is important to test the elementary assumption upon which our empirical system was contrived. The pagan Greeks were unable to invent an empirical version of science because they could not imagine substances that are not continually changing. More than a thousand years later, Catholic scholastics discovered the writings of one of the pagan philosophers, Aristotle. In their efforts to adjust his system to fit their religion, the friars used ideas about being and essence. In the Catholic metaphysics, everything can and does change, but what matter is, its essence, its intrinsic properties, does not change. The western system was founded on the medieval notion that the essence of substance is changeless. It is with this basic assumption that western empiricism was contrived. The Bible predicted our science. In the last days, Peter wrote, mockers will come claiming that all things remain the same. Peter used the phrase arche ktiseous to describe this idea. In Greek this can mean a first law. Peter described what the end time mockers will do with their first law, that all things remain the same. They will obfuscate the age and history of the plural heavens and reject the geological evidence for the twice inundated earth. Peter’s prophesy has come true. Scientists have invented the greatest system of mythology every contrived by man. Their universe is crammed full of invisible matter and vacuum stretching energies. Allegedly the vacuum of space is stretching the light from all ancient light clocks. They adjust every light clock in the universe to fit their standard clocks by means of absurd stretching vacuums. Visible galactic history shows that their empiricism is false, based on a false elementary assumption. We observe how galaxies started out as tiny naked globs, that shone at tiny fractions of the frequencies emitted by modern atoms. We observe how globs packed with tiny stars came out from those ancient cores and spread out. We observe how the star streams accelerated outwards as billions of galaxies at many ranges grew into huge, local, dusty growth spirals. Evidently matter increases its form (the space it takes up) as it emerges in jets from point sources in the heart of galaxies. What we see only fits a literal interpretation of Moses creation account in which the Sun, Moon and stars were not formed and continually placed in the spreading place until half way through the creation week. New telescopes are even now coming on line. New vistas of the early universe are available for all to see. He commands us to lift up our eyes and look. He says He is the one who spreads out the plural heavens in unbroken continuity. He claims to call the stars to come out so that none go missing. The Biblical creation is visible exactly as described in the Hebrew Bible. However, there is no way to force the creation to fit science, the system of measuring and mathematicating with a first law – the notion that all things remain the same. Look and glory the creator who will bring down western science for His great glory. The picture of a standard kilogram is from NIST, the National Institute of Standards and Technology.